I’d love to take credit for the simply brilliant idea of using candied (crystallized) ginger in a salad…but I can’t. I was at The Porter in Atlanta recently meeting some friends and sharing some craft beers, when a salad on their menu caught my eye…it mentioned candied ginger. Candied ginger! What a fabulous addition to a salad with fruit in it…why didn’t I think of that? I didn’t order it because it wasn’t what I wanted to have with beer that night, but the friend sitting next to me did, and kindly offered me a bite. I had just that one bite…and I knew I had to make my own version the moment the leaves touched my lips! It was a baby kale salad with fruits, nuts and ginger, and I told my friend I was absolutely going to try and recreate this fall salad. And I think my version tastes even better than the bite I remember…full of festive flavors. Baby kale, which is a bit bitter in its raw state, becomes something quite different when tossed with a cooked hard apple cider and shallot vinaigrette. Then add in some sweet toasted local pecans and crisp local Fuji apples, a Bartlett pear, a bit of candied ginger and this salad really comes alive. I’m not usually one to toss my salads because I don’t like for my greens to wilt under the dressing or to be overly dressed. But I have to say that this fall salad must be tossed to really enjoy the full flavor and to achieve a perfect bond between the ingredients. As the slightly warm and tart vinaigrette coats the sturdy kale leaves it begins to permeate them, creating a wonderful balance to the bitterness, turning it into bittersweet. The candied ginger is a perfect foil for the kale and is a spice match with the apple vinaigrette, fresh apple, pear and pecans. And yes, if you don’t like kale, you can absolutely use your favorite greens in this salad. In fact, I think you’ll find that my hard cider vinaigrette is a wonderful dressing for any green salad that utilizes fresh or dried fruits, root veggies or nuts. We’ve really, well…fallen for for this salad, and I hope you will, too! Heat the 1 Tablespoon of olive oil in a heavy bottomed saucepan over medium low heat. Add the shallots and cook, stirring until they begin to soften and are just about to start turning brown, about 2-3 minutes. Add the hard apple cider and the honey, bring to a simmer and allow to cook for about 5 more minutes, stirring, until the mixture has reduced by about a quarter. Remove from the heat and pour into a medium sized bowl. Whisk in the cider vinegar, Dijon mustard, kosher salt and black pepper. Then slowly whisk in the olive oil until the mixture is emulsified. 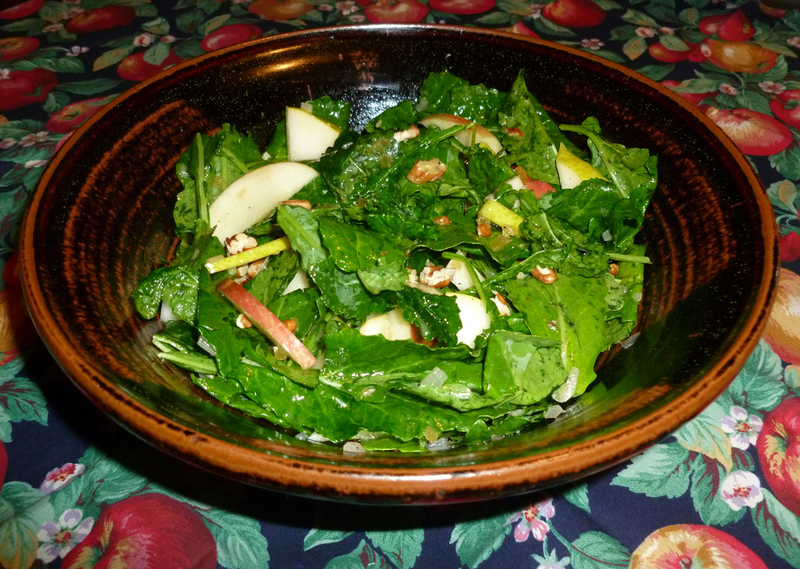 In a large bowl, combine the kale leaves, pecans, ginger, pear and apple. Pour over about 1/3 cup of the warm dressing and toss to coat well. Add a bit more dressing if needed to ensure that everything has a light coating of the dressing. Serve alongside your favorite dish or some roasted vegetable soup! The remaining dressing will keep for several days stored in an airtight jar in the fridge. 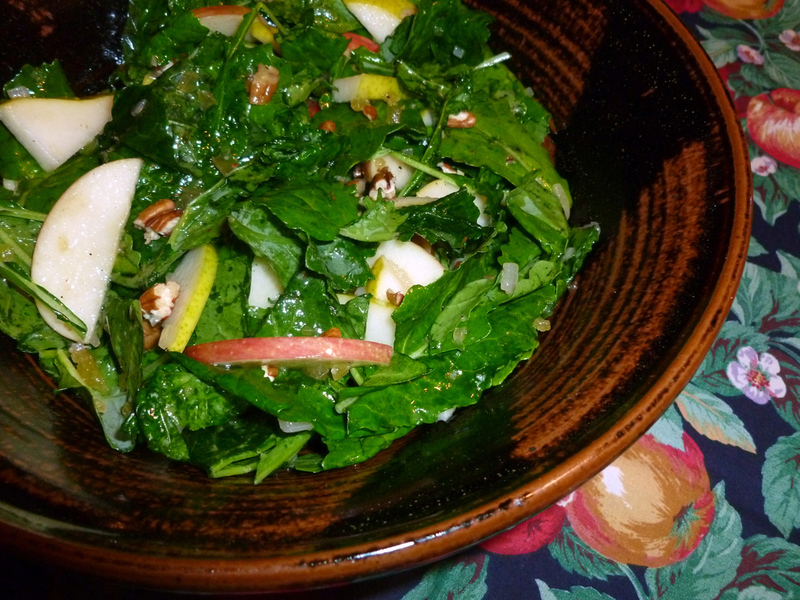 This entry was posted in Autumn dishes, Food, Salads and tagged apples, candied ginger, fall salads, Hard cider vinaigrette, Kale, pears, salads made with kale, Vegetarian by bitsandbreadcrumbs. Bookmark the permalink. Love this salad Betsy because I adore wilted greens, and the dressing being hard has a bit of a bite, yum! And I’ve never thought of adding candied ginger either, would you toss in some goats cheese to add some protein and make it a meal? I will try this for lunch on the weekend, for sure. I should have added that it eats like a meal without a protein (to me, at least) because the kale is so hearty. Having said that, a little parm never hurts and as I replied to Norma below, you could add some grilled pork tenderloin slices for a meat, which would be great with the apples and ginger. Isn’t hard cider considered an alcoholic drink? Or the cooking evaporates the alcohol? I am thinking like Eva, add some cooked meat or poultry or cheese to make a meal. Hi Norma, yes hard cider is alcoholic, not that sweet and cooking it evaporates the alcohol. You could use regular apple cider if you wanted and either eliminate the honey or have the dressing be a bit sweeter. As I replied to Eva, the salad is great as is and quite hearty…much more than you’d expect because of the kale. But adding some shaved parmesan would be good, and if you added a meat, I’d add lean pork, like tenderloin, because it would go so well with the apples and ginger. Kale is very tasty in a salad. Looks great! Thanks, Yummy! I agree, and this was my first kale salad. This salad has many wonderful ingredients and will tast good whether or not kale is the main ingredient. Your vinaigrette sounds especially tasty. I think we’re all glad you went out with friends that night. :). Mmmm something about this salad has me dying to try it! Thanks Charlie…I’ve made a regular apple cider vinaigrette before and one with just cider vinegar, but the hard cider adds another dimension, I think, and certainly goes well with the salad ingredients. I love kale. This looks wonderful! Thanks, Greg…it’s become one of my favorite greens. Thank you Giovanna, and thanks for your kind comment! I love the sound of your hard cider vinaigrette, Betsy. I’m never dying to eat more kale — when it comes into the house I deal with it by wilting it and making it into a salad dressed with tahini and lemon. But I would like this vinaigrette on just about anything. My friend Lisa is sending me some Georgia pecans so I might make your salad, perhaps with romaine and some Fuyu persimmons (the hard type). Thanks Sharyn! The vinaigrette is pretty special, and we like it on anything as well. It was perfect for the kale, but I also think tahini and lemon would be great on kale and I need to go back to your post about that now that you’ve reminded me and now that I’ve tasted kale in a salad. I have to say the baby kale is milder than the big guys. So, Georgia pecans and persimmons…sounds so interesting and I’m not sure I’ve ever tasted a persimmon and known what it was…so must try and rectify that…what do they taste like? Well, Fuyu persimmons are crispy like an apple, sweet and … orange, kind of spicy — like warm spices. Not to be confused with Hachiya persimmons which are soft and have to be soft to be edible — otherwise they are astringent. Those are the ones people make into puddings and cookies. Thank you! The Fuyu sounds amazing and I’ll have to see if they are available in my market. I had it in my mind that they had some orange-ness to them, but if I’ve tasted one, it’s been in something or long ago. I don’t see them in menus around here. I am always looking for new, different and seasonal salads. This definitely fits the bill. Wow! What an amazing array of flavors and colors. Hope your week has been great Betsy! Take care. What a clever idea…I’ll be trying this when I return from vacation. Thank you, Karen…I hope you will try it…it’s a pretty simple little salad, but very good. Hope you’re continuing to enjoy your vacation this weekend! Hi Betsy, you’ve served a perfectly seasonal recipe for us! I have cider vingar that I either get locally or pick up in France, and am wondering if it’s hard. I realise that hard cider is what I know as cider (apple juice is non-alcoholic) so I’m a bit confused but know I would love this combination. And I’d never had thought to use candied ginger in a salad – thank you ! Oh I love French Cider, perfect with a savoury crepe !! I’ve fallen for a similar salad, but without the crystalized ginger. I’m looking at a bowl of pears that are ripening by the minute, so I’ll have to give it a try Betsy. Hope that you are staying dry! Hi Barb, we haven’t had a drop of rain here, just a whole lot of wind for days and quite cold. I hope all is well with you and that you’re not suffering from the storm. Glad you like the salad…the crystallized ginger is so good with the pears.